If you’ve seen or heard of Proton Mail in the news recently you might just be wondering what exactly they are all about. Well, I’ll tell you. Proton Mail is an NSA-proof end-to-end encrypted email service built by scientists from MIT & CERN. You can read an in-depth review here. Yes this is all quite geeky I realize, but what they are building is essential to maintaining private communications in this day and age. And the best part is they are focusing on simplicity and usability. No encryption knowledge necessary. So anyways, a few days ago they launched an Indiegogo campaign raising $115K to expand their infrastructure to support the overwhelming response they’ve received. And in the time it took me to write this post they’ve hit $119K. It’s a valid argument, but at this point I don’t see how they could implement it any other way. They do give you the option of not encrypting a particular email, in which case it passes directly into the users inbox. But then why the hell would we use Proton Mail in the first place? Haha. I was cutting a quick video—which ended up not being so quick—for a friend. One not-so-small clip was recorded in 1080i 60 fps. Once imported into FCPX there were these twitchy artifacts forming every couple seconds during playback. I searched the web and the problem has to do with needing to first de-interlace the source video. One solution was to download a program called JES Deinterlacer. After a number of failures—the program would freeze after processing a short number of frames—I gave up and went to bed. The following morning I suspected that the freezing problem was due to the fact that I was working off an external hard drive. No bother. So after copying the file over to my Desktop I was able to process the entire video. The resulting file, after importing into FCPX, was free of those twitching artifacts. Sadly, however, the quality was degraded. But that is a side effect of de-interlacing. Read more about it here. Also, one solution was to allow FCPX to do the do-interlacing when you share out a master file, but I had no luck with that. Any time I rendered the project the resulting master file would contain the artifacts. I am very thankful for the JES Deinterlacer. Sometimes I need to change a GRID Server Administrator password over at Media Temple. Once changed, I continually run into SFTP connection issues. It’s goddamn frustrating. And it was just working! I just want to code, not putts around with this crap. Even more annoying is I can connect just fine via FTP on port 21. So in an attempted to save my sanity (and maybe yours), I’m going to list all the troubleshooting steps I’ve had to deal with every time this happens. Ug… so annoyed. Is your IP address blocked from too many failed login attempts? That’ll do it and drive you crazy. Here’s how to remove an IP ban. Are you connecting with the Server Administrator account or a secondary FTP account that you’ve created? Secondary FTP accounts aren’t allowed to connect via SFTP. So don’t bother. You’ll go mental until you figure this one out. Here’s more info on using FTP and SFTP. Have you tried a different FTP client? I use Coda for FTP (and development) and once I was able to connect via SFTP using FireFTP I narrowed the issue down to Coda. Which leads me to troubleshooting option 4. Have you restarted your FTP client? This is what burned me today. Once I restarted Coda I was able to connect via SFTP. Something was cached or confused. Honestly. You’re killing me Smalls. Well that was 2 hours well spent wasted. For the past few months I have been working on a subscription-based site that provides monthly custom curated trivia questions to bars and other establishments. It all began last summer at a friend’s wedding where I met the woman behind the trivia, the trivia girl herself, Katie Christofferson. Since 2010, Katie has been writing trivia questions for a number of bars across Montana, Idaho and Oregon. Initially, her whole business was run by snail mail. Once the trivia questions were written she would mail them on CDs to her clients. As you can imagine, this was a cumbersome process to say the least. If there were any issues or updates, she would have to do the entire snail mail process over again. Katie’s vision was to develop a user-friendly system where her clients would log in and download a new trivia package each month. Once signed up they would get the first month free, then to maintain monthly access they would need to subscribe to the service. And that is exactly what we built. With this system, making updates is a breeze and as easy as uploading a file. If any bar has a problem, Katie can update the affected accounts with new trivia. 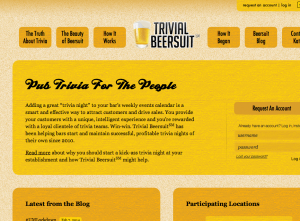 So without further adieu Katie and I are pleased to announced we’ve launched her new custom curated trivia service: Trivial Beersuit. So go forth, click around, check it out. If you’re a bar looking for this service I highly recommend giving Katie a what up! I am currently working on a subscription-based WordPress installation. For this project I am using a theme called Boilerplate. Users signup, pay their monthly fee (recurring or single payment) and get access to a set of restricted documents. After much research I settled on the follow plugins to handle payments and subscriptions. After installing both of them I ran into a problem where both the theme and the plugins were including jQuery at different times and different places and sometimes not at all. This broke jQuery for the entire site. The Stripe plugin payment form didn’t display correctly and you couldn’t submit it to run a payment. Also, some custom jQuery I had written stopped working too. After some back and forth with the Boilerplate theme developer (Thanks Aaron!) he came up with the following solution. 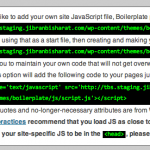 In Boilerplate Admin, enable and keep your custom JS (script.js) in the footer. Do this even if you don’t have any custom jQuery. Do not use the Boilerplate jQuery (leave those checkboxes unchecked in the Boilerplate Admin). So, by default no jQuery is loaded by the Boilerplate theme. Once the custom JS file is included, it checks to see if jQuery has been defined. If not it loads it from the Google CDN. If that fails then it loads in your local copy. 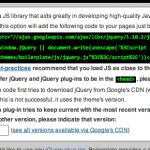 If you are on a page that uses either plugin listed above, then jQuery will have already been included. In this case when your custom JS file loads it checks and will see that jQuery is already loaded and will not include it again. So that’s about it. I do believe this solution would work for any plugin in general that conflicts with the Boilerplate theme. If you’ve run into similar issues with any plugin please do share your experience in the comments. Happy WordPressing! I was in Ballard. At the Ballard Market, to be exact, food shopping for a summer camping trip. I was in the grocery section—because it’s more than just an isle—and I ran into a friend. We chatted for a few minutes, about, you know, the usual banter: I’m going camping—and I do love your new shoes! During our banter session my friend mentioned that her friend’s friend’s cousin’s (don’t lose me here) former college roommate, a talented artist, needed some web work. Well, ok, it’s actually just my friend’s friend and I like Spaceballs, but not all of this is necessary factual. How about it’s based on a true story? Yeah, we’ll leave it at that. I saved my friend’s friend’s information and we went our separate ways. The friend’s friend’s name was Christine Chaney. We met and instantly hit it off. We worked together for the last few months building an online presence that fit her style of artistry: bold and mathematical, sparse yet emotional. Her style is only enhanced by the shear number of mediums in which she creates. 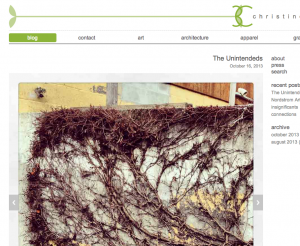 From architecture to fashion, from wall art to photography. She’ll sew you a dress and design you a building and artwork to match. And then she’ll compile all these connective art pieces into a book, which is yet another art form in itself. Yup. These are the people I love to work with. Anything goes. The sky’s the limit. And inevitably these creative creatures become my friends. So after many meetings from a chance encounter at my neighborhood market, I am pleased to announced that not 24 hours ago we launched Christine’s new website. It is a sparse, clean and fully responsive experience, so try it out on all your devices. Leave us a comment and let us know what you think. Good day.